If you’re in the market for a low cost embedded Linux development board then look no further than the Omnima embedded controller. 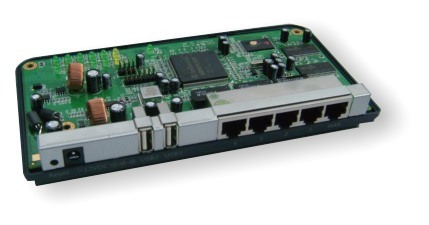 £23 gets you a MIPS platform with Ethernet and USB host ports, 16MB of RAM and (via OpenWRT) a wide-ranging repository of pre-packaged Linux applications and libraries. Compared to the likes of the Arduino, this is a lot of bang for your buck. Omnima deliver this board with their own Linux distribution derived from OpenWRT known as Squidge, but development on this has been discontinued in favour of vanilla OpenWRT. This post describes how to set up a development environment so that you can build and run bleeding edge vanilla OpenWRT on the Omnima board, rather than relying on the now out-of-date Squidge distribution. The Omnima board has a limited amount of flash (2MB) so you will use an additional USB memory stick for storing the root filesystem (rootfs). You can use this guide if you are interested in kernel development or application development; OpenWRT provides an environment for working at both the kernel and the application/library level. As a bonus there are also instructions below for including a Python interpreter. The Omnima provides a very cost-effective development embedded platform for Python development, however beware that 16MB of RAM is not a huge amount when you factor in the Linux operating system, Python interpreter etc. Much of the OpenWRT build information came from this message on the OpenWRT forum by Heruan. We flesh that out here with further instructions for fully configuring the device and installing packages such as an SSH server and the Python interpreter. There is an Ubuntu slant as the PC used in this case was running Ubuntu but the same principles will generally apply across any distro. If using minicom you should configure the serial port device name which it will use. USB-to-serial converters will generally come up as /dev/ttyUSB0, but you can confirm this by connecting the cable between your PC and the Omnima, and running dmesg to view the new device name. With the device name known you can run minicom -s to change the default port name. The feeds update script downloads the latest package tree which you can use to add many auxiliary applications and libraries to the base OpenWRT installation. We will make use of this later to install python-mini. Your kernel image for programming in flash, and rootfs for copying onto the USB memory stick will be built in the bin directory. You now have a USB disk containing a rootfs which is configured and ready to connect to your network at bootup, and which contains a selection of packages which you can install from the serial terminal (including an SSH server). You should unmount the USB disk now and insert it into one of the device’s USB ports. xmodem-upload script from Heruan’s article. You should download this and make it executable using chmod +x xmodem-upload. Power down the Omnima device and insert the USB disk. Check that your serial cable is connected to the device, and verify the serial port’s Linux device name (if you are using a USB-to-serial converter, plug the USB cable in and view the results of dmesg to find the device name). It will usually be /dev/ttyUSB0. If it is USB1 or higher on your machine, you will need to edit the xmodem-upload script to use the correct device name. You should see the flash erase and flash programming phases complete. Once these are done, you are ready to reboot your board and run your new OpenWRT build. You can view debug output from the entire boot process on your serial terminal. Assuming the build was successful, on booting up you will be prompted to press Enter and will see a command shell. Your unit is now booted into Linux and ready for installation of your own applications. If this happens then check your USB disk is inserted correctly and confirm that the USB driver was correctly built into the kernel in kernel_menuconfig (ADM5120 HCD support under the USB section – this must have a ‘*’ and not an ‘M’ or blank). With an Ethernet cable inserted into the WAN port you should now be able to communicate with the board, which can be tested using ping or similar. If there are any problems with the network, double-check your /etc/config/network file. This can be done from the serial terminal (which you can edit it “online” using vi). Before allowing clients to log in using SSH you must set root’s password using the standard passwd command. Be patient while this loads. Eventually you will be able to SSH into the unit from elsewhere using the password you set above. You will now find that the SSH server starts every time you boot the Omnima. With all of this in place, you have a remarkably full-featured Linux system at your disposal. You can install applications from the internet, write and install your own applications, modify the kernel etc. You can now execute the python command and you will be presented with the Python interpreter. You can now download and install prebuilt OpenWRT packages from the internet. This entry was posted in HowTo and tagged Embedded, Kamikaze, Linux, Omnima, OpenWRT, Python, Ubuntu. Bookmark the permalink.